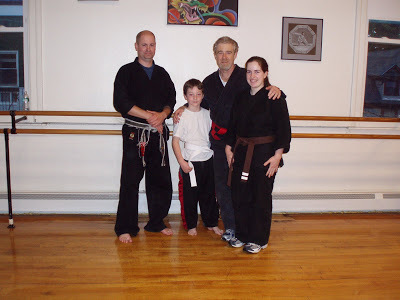 Ryan earns his White belt after training for one month! 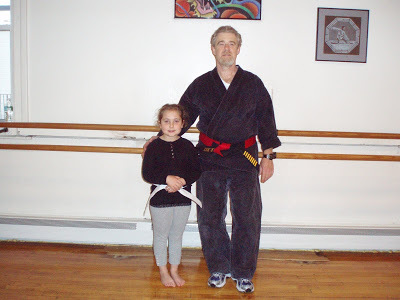 With Mr. Kratz, Sifu Roy, Black belt candidate and Staff member Colleen G.
Jianna earns her White belt after training for one month! 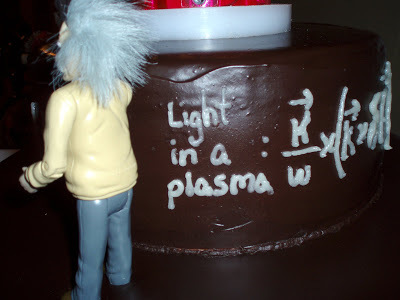 Light in a plasma cake! 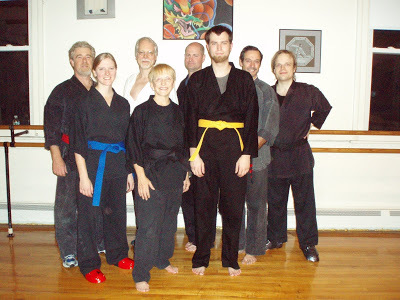 Shawn D. was promoted to Yellow belt this past Thursday afternoon. He is flanked by JRRMAS Staff members from left to right, Marcia G. myself and Colleen G.
Sharon M. and her fiance Chris visited the Studio this past Saturday morning. 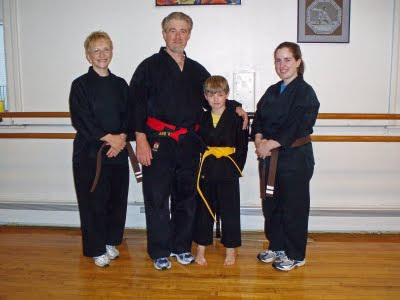 Sharon is an American Karate-do Black belt (second Dan) and former JRRMAS Staff member. Their baby (Aiden) is due in 4-5 weeks. Next time they visit they will have young Aiden with them!! The miserable symptoms of a cold or the flu are actually signs that your immune system is working to fight off the offending virus. You get a fever, for example, because your immune system’s cells work better at a higher body temperature, while germs don’t reproduce as well at higher temperatures. The swelling in your sinuses is due to the fact that armies of immune cells are rushing to the area to fight the germs. A runny nose allows your body to flush out germs along with mucus. 1. Don’t smoke. If you already smoke, try to quit, even if you’ve been unsuccessful at kicking the habit in the past. 2. Eat a diet high in fruits, vegetables, and whole grains, and low in saturated fat. 3. Take a multivitamin if you suspect that you may not be getting all the nutrients you need through your diet. 6. Control your stress level. 8. If you drink alcohol, drink only in moderation. 10. Take steps to avoid infection, such as washing your hands frequently and cooking meats thoroughly. 11. Get regular medical screening tests for people in your age group and risk category. 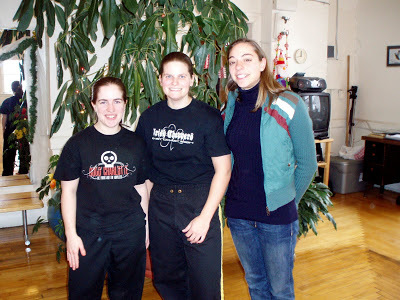 American Karate-do Black belts Jennifer L. and Sharon M. pose with one of our currently active Green belts Lily S.
I have an earlier version of this photo from when Sharon and Jennifer were both White or Yellow belts…If I can find a digital version I’ll post it! 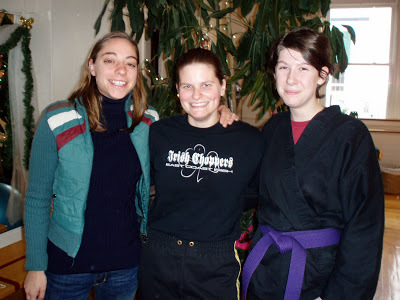 Posing with currently active JRRMAS Staff member and Black belt candidate Colleen G. – It’s so helpful for our Studio community when Black belts that have moved away or just become inactive for one reason or the other come back and visit…it adds so much depth and history to the students experience. 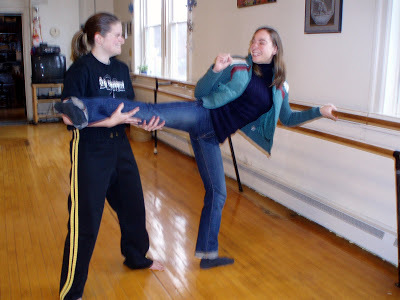 Calling all American Karate-do and Modern Arnis Black and Brown belts as well as all 5+year T’ai Chi and Bagua practitioners to please come in and visit!! You are all welcome to come and visit …..ANYTIME!! 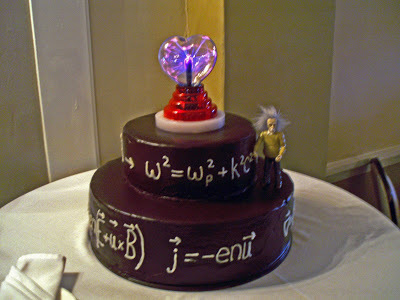 Yesterday, Jeff Levesque (AKS Black belt) and Annette Giuffrida were married. 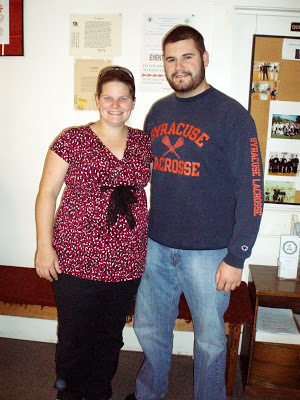 They met while at college at RPI where they both did their undergraduate studies. Jeff in physics and Annette in architecture. They currently live in NY City and will be leaving for their Honeymoon to New Zealand on Wednesday. Congratulation’s and best wishes to Jeff and Annette and their families!The wedding and the reception were just wonderful. It’s so great to see Jeff and Jennifer doing so well in life. Norm and Carol are so fortunate to have brought up such exceptional children …they have both turned out to be such great people and I know that that makes both Norm and Carol very happy.I have more vid’s and photo’s to come!